have been finalized and published on the internet. These rules come into effect on January 1, 2017. The complete text can be found at the World Sailing Site. As in previous rulebooks, all changes from the previous version of the rules are indicated by change bars in the margins. But the change bars won't do you much good, as they don't indicate what changes were made. And even if you do a word-by-word comparison, you still generally won't know why the change was made. If you do look at the study version, you'll see a lot of red. From this, you might conclude that the new rules are a huge revision of the 2013-2016 rules; but for most sailors, the changes are extremely minor. Originally this page was only supposed to contain the most important rules. While the individual rules are simple to understand, the reader can only profit if the relationships and the application of the rules are explained for specific situations. That's why this page has developed in a way which hadn't originally been planned. More and more examples had to be presented in order not to remain a little too superficial and stay at sailing school level. The page became more extensive, although at the moment has still nowhere near covered all aspects of the rules. For this reason, and because of the high level of interest in this topic, we decided to make the page much more comprehensive than originally planned. Maybe we will confuse new Regatta sailors, but on the other hand the page will be more interesting for the more ambitious ones, and they are actually our target group. This page is far from finished but we believe that the current contents will be sufficiently interesting for Regatta sailors to justify opening the 'building site' to the public! The following text was adapted to the RRS 2017-2020. But be aware this is the first version of the revised text and be shure there are a lot of errors in it. We will work on this issue during the next months. This text is a Rule Crash Course, and not a page dealing with all changes in the RRS 2017-2020 If you are interested only in the changed issues we recommend the text written by Dave Perry..
A good knowledge of the Racing Rules of Sailing is an important pre-requisite for the development of strategy and tactics. If you continually have to think which boat actually has right of way during a race, then you should do some hard work on this subject. All quotations from the Racing Rules and the Casebook are in green text. Because they are clearly marked by this text, quotation marks have not been used. What else is there, apart from the racing rules? The Racing Rules of Sailing can be compared to a law. As with every law, there are also different interpretations of the rules. For this reason the ISAF published the so-called 'Case Book' which covers interesting cases which were brought before this body. These cases are binding for Juries, just like High Court judgements in civilian life. We will refer back to individual published cases regularly when explaining the rules. In addition, there is the so-called Q&A Panel on the ISAF website. Juries can take actual cases to this Panel, for which a relatively quick response will then be provided. The difference is, that these cases are not yet binding. Only if the ISAF puts a case from the Q&A into the Case Book is the answer binding for Juries. All the cases and Q&A's quoted here are taken from the years 2013-2016. Saiing.org did not publish a new versin until now, but we have tried to quote only cases which are still valid now. 18.2. (b) If boats are overlapped when the first of them reaches the zone, the outside boat at that moment shall thereafter give the inside boat mark-room. If a boat is clear ahead when she reaches the zone, the boat clear astern at that moment shall thereafter give her mark-room. I hope that, after this example, everyone will understand why we focus relatively intensively on definitions in the following. One boat is clear astern of another when her hull and equipment in normal position are behind a line abeam from the aftermost point of the other boat's hull and equipment in normal position. The other boat is clear ahead. They overlap when neither is clear astern. However, they also overlap when a boat between them overlaps both. These terms always apply to boats on the same tack. 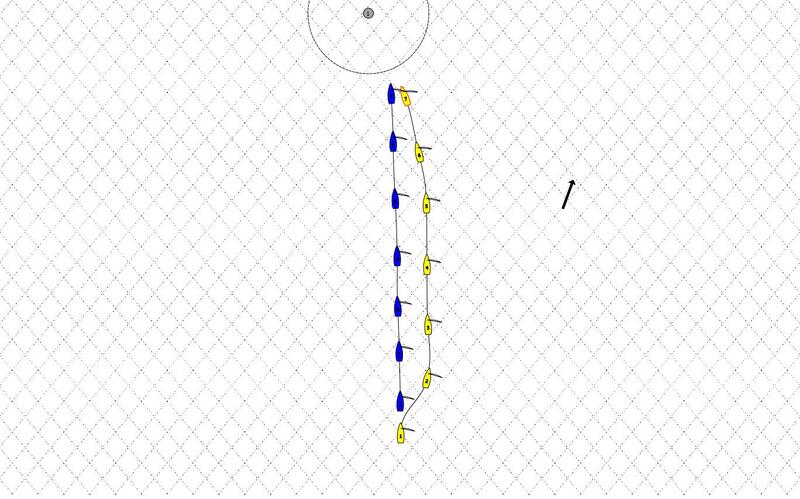 They apply to boats on opposite tacks only when rule 18 applies between them or when both boats are sailing more than ninety degrees from the true wind. Think – now is that already a lot clearer? To understand the rules, it is really important to be completely sure about the most important definitions. In contrast to the definition of zone, this is not about the hull, but also about equipment in normal positions. Parts of the boat below the water must also be considered here. Therefore the yellow and the blue boat are fetching the mark, but the green boat isn't. That the blue boat has to luv until head to wind to get round the mark is therefore irrelevant. (c) continues to sail the course. (a) is about the penalty on or near the finishing line. A boat only goes through the finishing line if it crosses coming from the side of the course again after carrying out the penalty. In this case, blue must keep away from yellow. If both boats sail straight ahead, there wouldnt be any contact. Because, however, yellow could make contact with blue if it even slightly changed course, according to the definition above, blue is not keeping clear of yellow. This applies, in contrast to earlier, even if the boats are sailing with the wind from different directions. Blue is not keeping itself free from yellow, because the slightest change of course by yellow would lead to contact with blue. A boat may avoid contact and yet fail to keep clear. Damit ist gemeint: Auch wenn es zu keiner Berührung zwischen Gelb und Blau käme hat sich Blau in diesem Fall nicht genügend freigehalten. 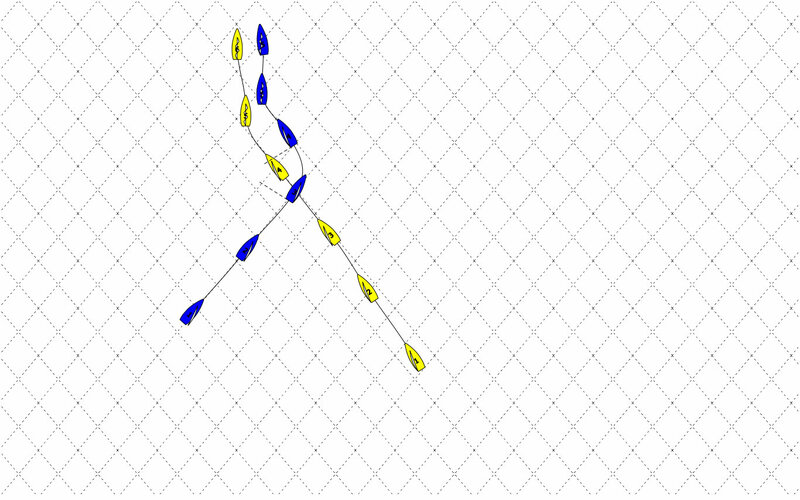 Yellow and Blue, two keelboats about 24 feet (7 m) in length, approached each other on a windward leg, sailing at approximately the same speed in 12 to 15 knots of wind and 'minimal' sea conditions. Blue was slightly ahead. 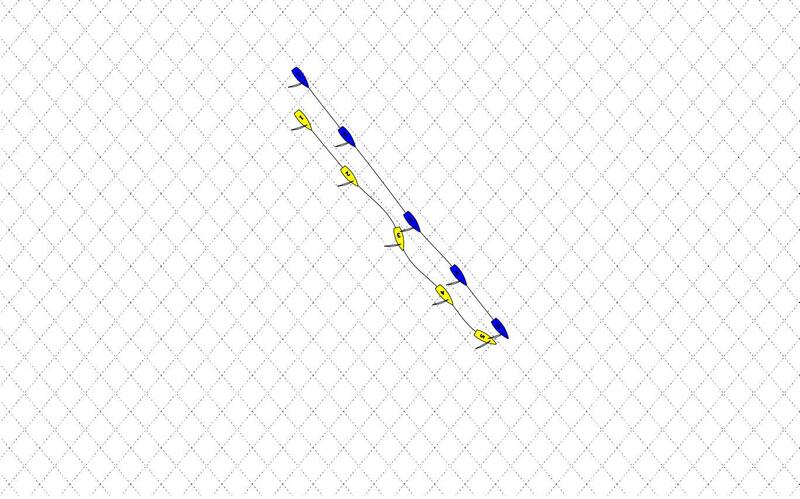 When approximately three hull lengths away, Blue hailed 'Starboard' and did so again at two hull lengths, but Yellow did not respond or change course. 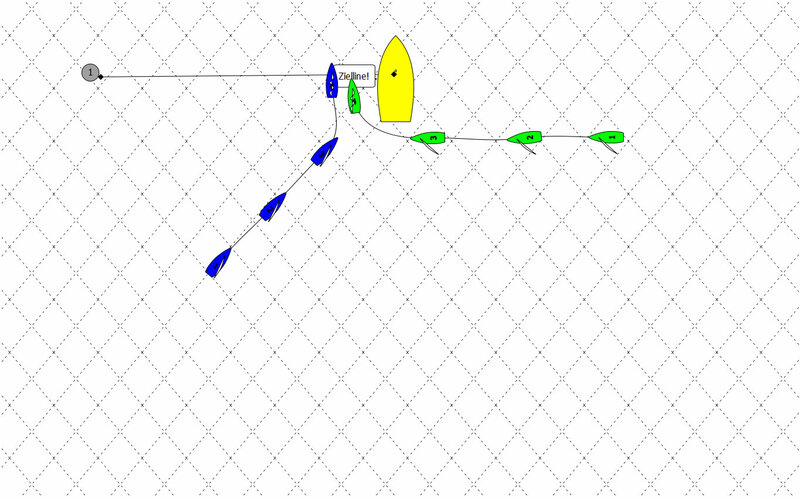 At position 1 in the diagram both boats changed course at the same moment. Blue, fearing a collision, luffed sharply intending to tack and thereby minimize damage or injury, and Yellow bore away sharply. As soon as she saw Yellow bear away, Blue immediately bore away also. Yellow, with her tiller turned as far to port as it would go, passed astern of Blue within two feet (0.6 m) of her. There was no contact. Blue protested under rule 10. The protest committee decided that Yellow did not break rule 10. It then considered whether Blue had broken rule 16.1 or 16.2 by luffing and then immediately bearing away. It concluded that she had not, after finding that her course changes did not affect Yellow, which was already making a severe course change that would have been necessary even in the absence of Blue's actions. Blue's protest was dismissed, and she appealed. 1. the courses of the boats when the incident began. They were on collision courses, which meant that at least one of them would have to change course. 2. the distance between the boats at the moment both boats changed their courses. 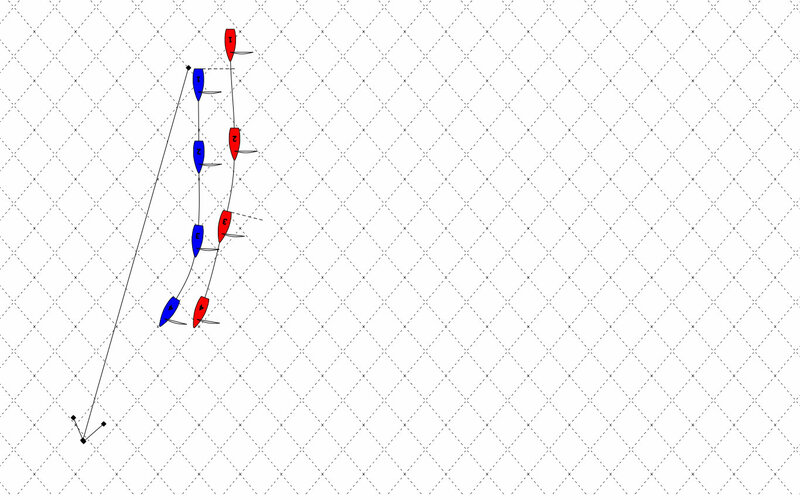 After position 1, if neither boat had changed course, Yellow's bow would have struck the leeward side of Blue after the boats had sailed approximately two-thirds of a hull length. 3. the estimated time remaining before contact. When both boats changed course there was very little time remaining before a collision would have occurred. For example, at a speed of five knots one of these boats would travel two-thirds of her length in 1.9 seconds. At six knots it would be 1.5 seconds. 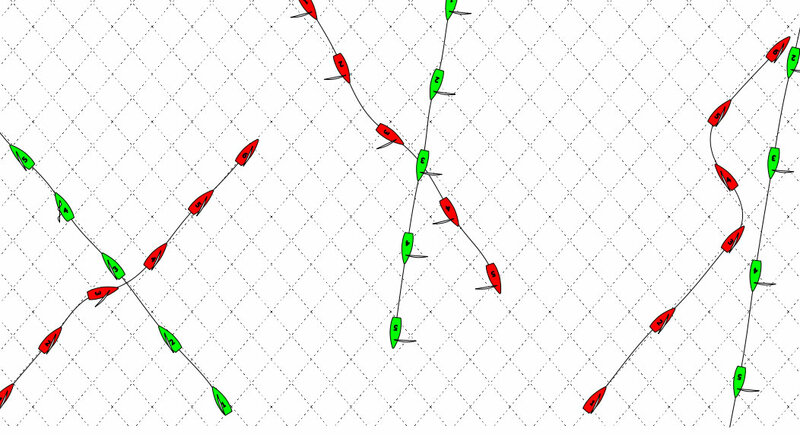 4. the extent of the course change needed by each boat to avoid a collision. This increased as the boats came closer. 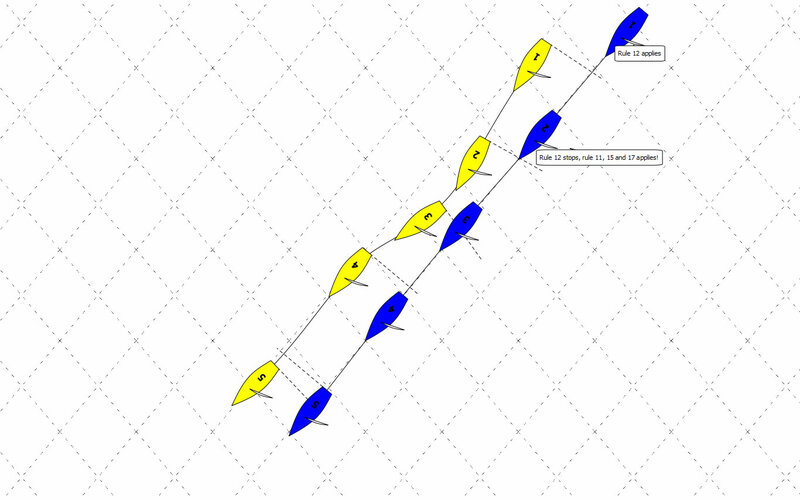 At the time Yellow changed course, the change required was such that 'with her tiller turned as far to port as it would go' she passed Blue's stern 'within two feet' (0.6 m). At the same moment, the course change Blue would have needed to avoid Yellow if Yellow did not change course was approximately 90 degrees because Blue would have had to tack. 5. the time required by either boat to make the necessary course change. This factor was itself determined by several others: the boat's weight and speed, her underwater hull shape, the size of her rudder, the sail handling required, and wind and sea conditions. 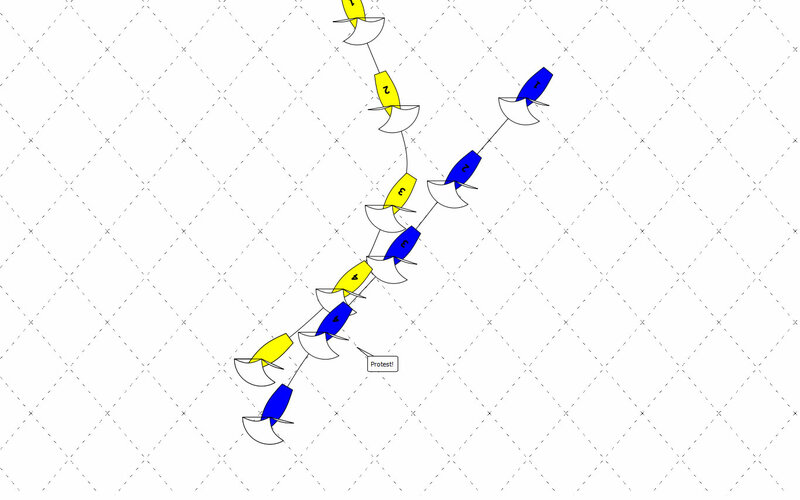 When the boats reached position 1 in the diagram, Yellow was not keeping clear. A collision was imminent, and almost unavoidable, as shown by the fact that with helm hard over Yellow passed less than two feet (0.6 m) from Blue's stern. At that diagram position, Blue had no assurance that Yellow had heard her hails, or was preparing to change course, or even that Yellow was aware of the presence of Blue. Also, Yellow had sailed beyond the point at which she should have borne off, either to minimize the time and distance to reach the windward mark or to sail a course chosen for tactical reasons. For all these reasons, Blue was clearly unable to sail her course 'with no need to take avoiding action' and so Yellow broke rule 10. Blue was fully justified in expecting a collision and in concluding that only her action would prevent it. There is no need to address the question of whether or not Blue broke rule 16.1 or 16.2 because, by the time Blue changed course, Yellow had already broken rule 10, and Blue, acting as required by rule 14, changed course to avoid a collision. Even if the facts had indicated that Blue had broken rule 16.1 or 16.2, she would have been exonerated as provided in rule 64.1(c). A boat required to keep clear must keep clear of another boat's equipment out of its normal position when the equipment has been out of its normal position long enough to have been seen and avoided. An object the sailing instructions require a boat to leave on a specified side, and a race committee boat surrounded by navigable water from which the starting or finishing line extends. An anchor line or an object attached accidentally to a mark is not part of it. Thanks to the new clearer text, the endless boring discussions and different interpretations are at an end. The Q&A on this topic of February 2009 are now invalid. We come back to the meaning of this definition in the discussion of Rule 18.
area so designated by the sailing instructions are also obstructions. However, a boat racing is not an obstruction to other boats unless they are required to keep clear of her or, if rule 22 applies, avoid her. A vessel under way, including a boat racing, is never a continuing obstruction. Unfortunately, nowhere in the definition is it stated how big a continuing obstruction must be. This missing definition gains significance when, in Rule 19, a difference is made between an obstruction and an continuing obstruction. More of that later. A course a boat would sail to finish as soon as possible in the absence of the other boats referred to in the rule using the term. A boat has no proper course before her starting signal. This is about how you would sail a course if no other boat was on it. Before the Start, there is no correct course, that is why there are also no Luv restrictions for boats which have overtaken from behind. Rule 17 can therefore not be used before the Start. Because individual sailors have different sailing styles and not all boats are exactly the same, so their proper course is also individual. This means that two boats in a class can sail on different proper courses. A boat starts when, having been entirely on the pre-start side of the starting line at or after her starting signal, and having complied with rule 30.1 if it applies, any part of her hull, crew or equipment crosses the starting line in the direction of the first mark. Just to make sure this is clear, even after the starting signal, boats which are still behind the starting line have not yet started. Early starters have also not yet started. This is significant in so far as Rule 18 does therefore not apply, even to sailing back behind the starting line. A boat is on the tack, starboard or port, corresponding to her windward side. Attention: A change in the size of the zone in the sailing instructions is not allowed.in the current RRS. It is important in this definition that in this case, a boat is only in the zone if a part of the hull is inside the zone. Spinnakers, Gennakerpoles or similar don't count. For the sake of completeness however, it is quite different for the definition of overlapping. I assume everyone knows the following right of way rules, but for the sake of completeness we didnt want to leave them out. 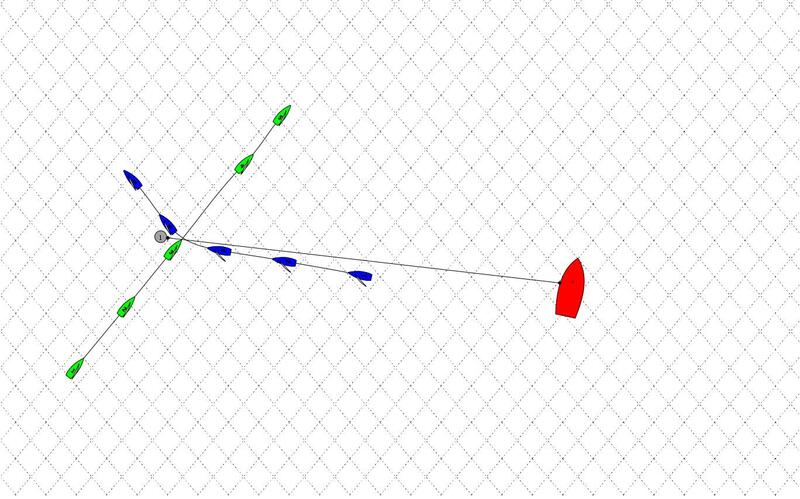 In the following animation, red is always the boat which should keep clear. Even with this simple rule, things arent always as clear as they seem. In the following animation you can see that green would pass by clear of red. Red may have to give way, but doesnt have to change its course to stay out of the way. Green …. in position 3 and is now on a collision course. Because he is giving red plenty of time to stay clear, red must now change his course to do this. Green is not required to stay on a proper course so the change of course towards red is permitted. (Case 105). When boats are on the same tack and overlapped, a windward boat shall keep clear of a leeward boat. 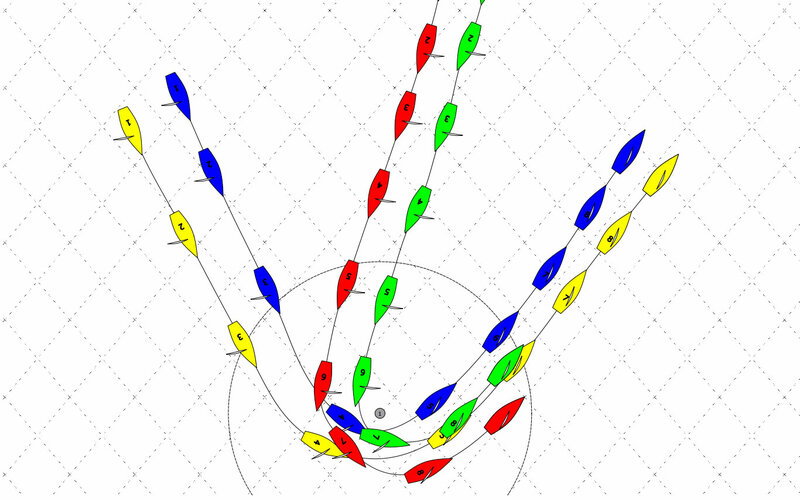 After a boat passes head to wind, she shall keep clear of other boats until she is on a close-hauled course. During that time rules 10, 11 and 12 do not apply. If two boats are subject to this rule at the same time, the one on the other's port side or the one astern shall keep clear. Interestingly, there is no definition in the Definitions section for 'tacking'. The definition is given by the rule described in this scope. A boat tacks as soon as it passes through the wind. The tack ends when it finds itself on an close-hauled course. It is irrelevant whether the sails flap, the boat has increased speed or anything similar. It is only important is the position of the hull to the wind. It is always maintained that you should stay clear when jibing, however there hasn't been a rule about this for ages. If a boat jibes, the applicable rules normally change at that moment when the boom passes the middle line off the boat. But basically we should manage with Rules 10 and 11 when jibing. Not so in a Match Race: in Appendix C, Rule 13 also applies to the jibe, but Match Race rules are not our topic here. not cause damage or injury. This rule states clearly that in general contact between boats is to be avoided, and that boats with right of way must also move out of the way to avoid a collision. The boat with right of way is however excused if no damage or injury is caused. Most rules of Part 2 of the WWR are valid only for boats which are racing (A boat is racing after the preparatory signal.. You can fin this issue in preamble of Part 2. Until RRS2017 there was only one exception from this principle: Rule 24.1. (Interfering with another boat). Now it is also possible to penalize a boat not racing under rule 14. A right-of-way boat need not act to avoid contact until it is clear that the other boat is not keeping clear. This means that a right of way boat must only change its course to avoid a collision if it is clear that the keep clear boat can not keep clear. . In this case, if it came to a collision with damage, green has to avoid contact under Rule 14. However, the second sentence of rule 14 allowed green to sail her course in the expectation that blue would keep clear as required, until such time as it became evident that blue would not do so. In this case, the diagram shows that blue could readily have borne off and avoided green from a position very close to green. For that reason, the time between the moment it became evident that blue would not keep clear and the time of the collision was a very brief interval, so brief that it was impossible for green to avoid contact. Therefore, green did not break rule 14. The following case actually says the same as Case 87, but the other way round. A right-of-way boat need not act to avoid a collision until it is clear that the other boat is not keeping clear. However, if the right-of-way boat could then have avoided the collision and the collision resulted in damage, she must be penalized under rule 14. The occasion of this Case was a collision between two boats in different races. The boat with right of way held to its course, even though it realised that the boat which should give way would not be able to do so. Because a collision with damage was caused, the boat with right of way was also disqualified under Rule 14. 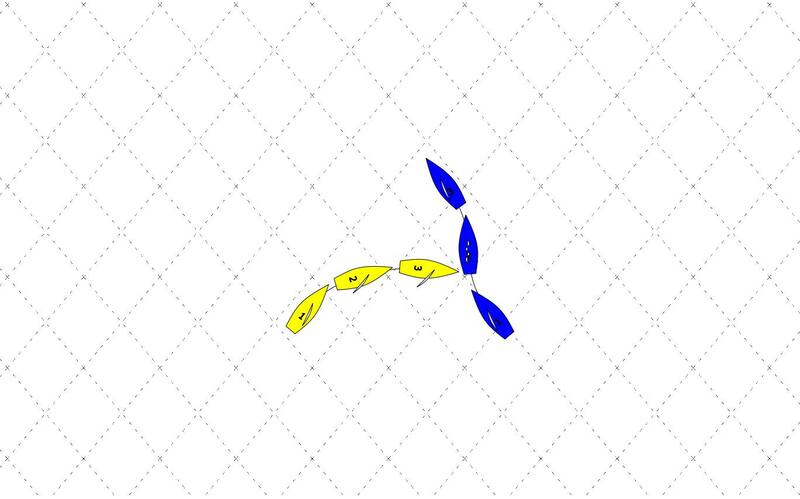 In the following animation, blue could recognise, from Position 3, that yellow would not avoid him. Blue fell away immediately he realised this to avoid a collision. If blue had not moved away and had crashed into the rear of yellow, and damage had been caused to either boat, Blue would have been disqualified at an appeal under Rule 14, and Yellow under Rule 10. If blue had begun his manoeuvre in Position 3, but a collision would still have occurred, blue would not have infringed Rule 14 because before Position 3 it was not clear to him that yellow would not keep clear. . In this case, red begins to luff immediately after it caused an overlapping to the lee of green. This means red infringed Rule 15. Green, according to rule 11, should give way but will not be penalised because red broke rule 15. Rule 64.1.c. states that a boat breaking a rule is to be exonerated if it is caused by another boat breaking a rule. . If a boat luffs immediately after she becomes overlapped to leeward of another boat and there is no seamanlike action that would enable the other boat to keep clear, the boat that luffed breaks rules 15 and 16.1. The other boat breaks rule 11, but is exonerated under rule 64.1(c). In the following animation yellow jibes windward of blue. Blue therefore becomes the lee boat and is obtains right of way. Because this right of way has been granted because of the actions of yellow, the first part of Rule 15 does not apply, yellow is immediately obliged to give way, and would in an appeal be disqualified for breaking Rule 11. 16.1 When a right-of-way boat changes course, she shall give the other boat room to keep clear. 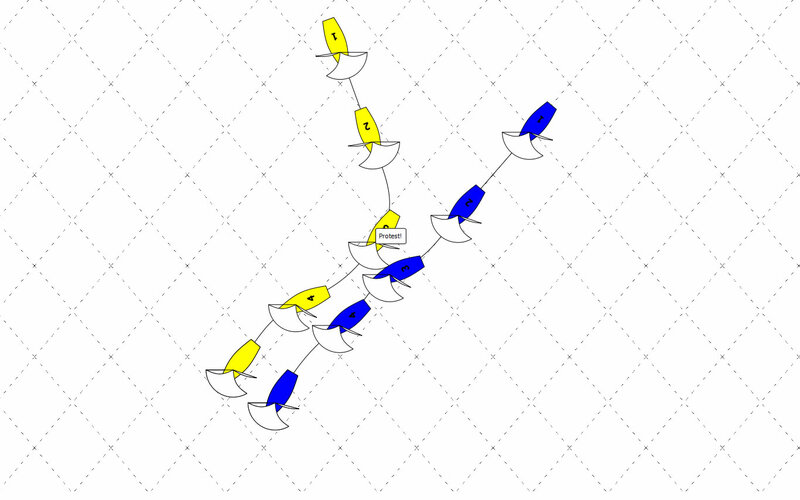 The following animation shows the same case as above, however blue is changing its course to windward. In this case, the situation with the rules is judged differently.Yellow should according to Rule 11, give way, but is protected by Rule 16 and blue would be disqualified. 16.2 In addition, when after the starting signal a port-tack boat is keeping clear by sailing to pass astern of a starboard-tack boat, the starboard-tack boat shall not change course if as a result the port-tack boat would immediately need to change course to continue keeping clear. Green and blue approach the finishing line. In this case, Rule 10 applies to green and blue. Rule 18 does not apply because both boats are sailing with wind from different directions. Green is far over the lay line, reaching to the stern of the finishing vessel. 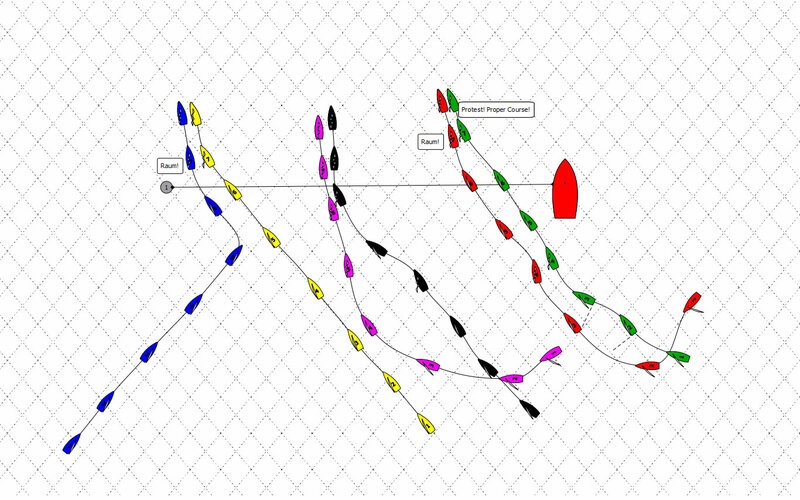 After passing the stern of the finishing vessel, green's correct course changes to a Close hauled course. Blue could however pass in front of green, if green had continued on his original course. According to 16.1, green does not give blue enough time after changing his course, to keep itself clear. The breaking of Rule 10 by blue is therefore not to be penalised, because of Rule 64.1.8 (c). Green will be disqualified. because the wind shifts to the right, the boat with wind from starport could sail higher, but is not allowed to change his course immediately. When a right-of-way boat changes course, the keep-clear boat is required to act only in response to what the right-of-way boat is doing at the time, not what the right-of-way boat might do subsequently. The example used for Case 92 was different to that described here. The following situation is always being misinterpreted in praxis. It is not found anywhere in the rules,that the keep clear boat must anticipate what the right of way boat will do. Naturally we understand that boats luff to a close hold course after the starting signal, or will luff again after passing the stern of another boat, but we must not consider all this when judging a situation. 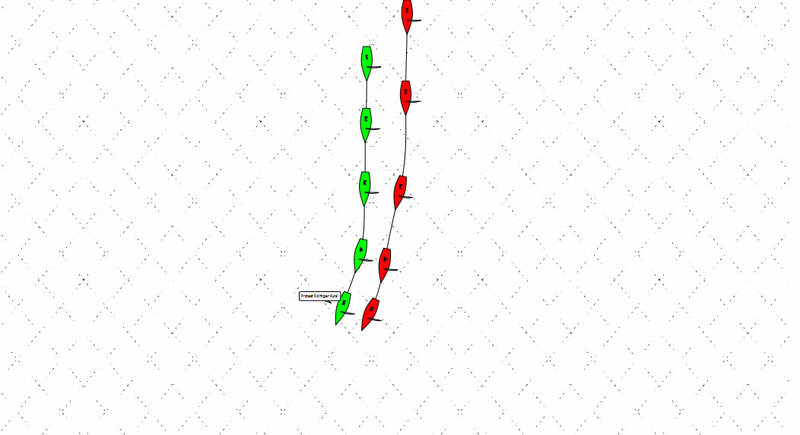 Green must not anticipate that blue will change course to close hauled after the starting signal. If blue travels further, as before, green can pass clearly by blue. But be careful: 95% of all Juries would disqualify green under Rule 10. If a boat clear astern becomes overlapped within two of her hull lengths to leeward of a boat on the same tack, she shall not sail above her proper course while they remain on the same tack and overlapped within that distance, unless in doing so she promptly sails astern of the other boat. This rule does not apply if the overlap begins while the windward boat is required by rule 13 to keep clear. The definition of 'proper course' is important in order to understand this rule. To repeat: The proper course is the course a boat would sail to finish as soon as possible in the absence of the other boats referred to the rule using the term. Two jibes break up the overlap, and Red is no longer tied to his proper course. The last sentence of the definition of 'proper course' is important when using this Rule: A boat has no proper course before her starting signal. Though Green has created the overlap aft to leeward, however is not restricted to his right to luff and therefore may, under Rules 14, 15 and 16.1 luff until head to wind. After the starting signal, Rule 17 comes into effect and Green may not luff over his proper course. 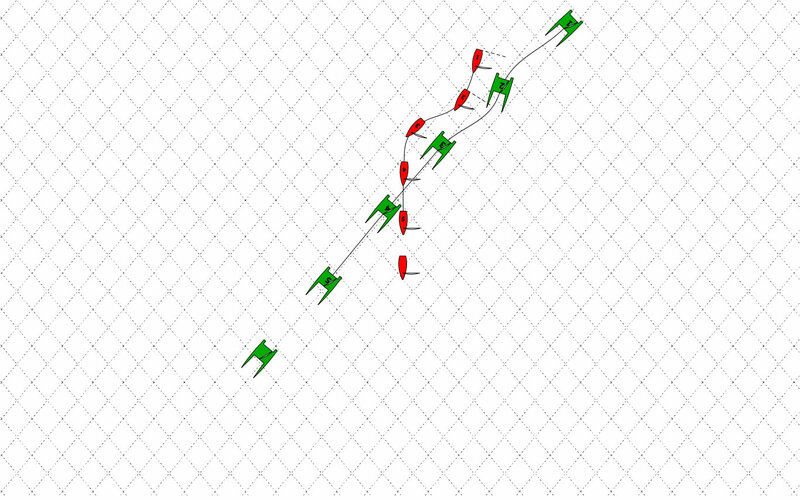 The following animation shows similar situations after the starting signal. The deciding factor therefore, is how the situation developed and how the last overlap was produced; not always easy for Umpires on the water to decide.. Looking at the two boats on the outside right, after the starting signal Red is subject to this luff restriction because the overlap from aft was produced to leeward. 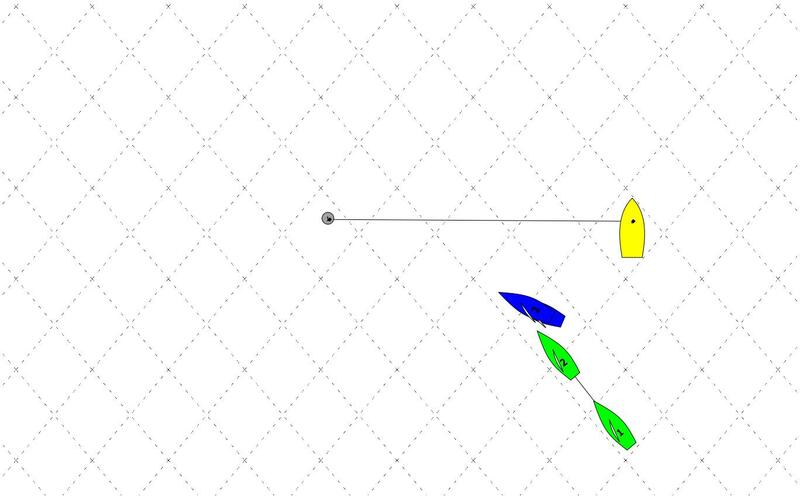 Though this was several seconds before the incident, the duration of the overlap is not relevant for the judgement of this situation..
With the two boats on the left, the overlap was caused by Blue's tacking, so Blue is not affected by the restrictions of this rule. 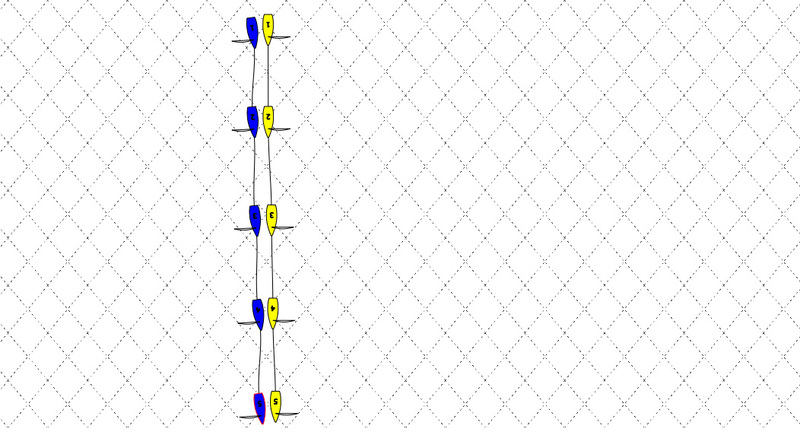 Violet did overlap from aft and leeward of Black before the start, but because there are more than two boat-lengths' distance during this overlapping, the luff restriction for Violet no longer applies. The Rules are actually simple and clear, but in any racing situation it is seldom that just one Rule can be applied. 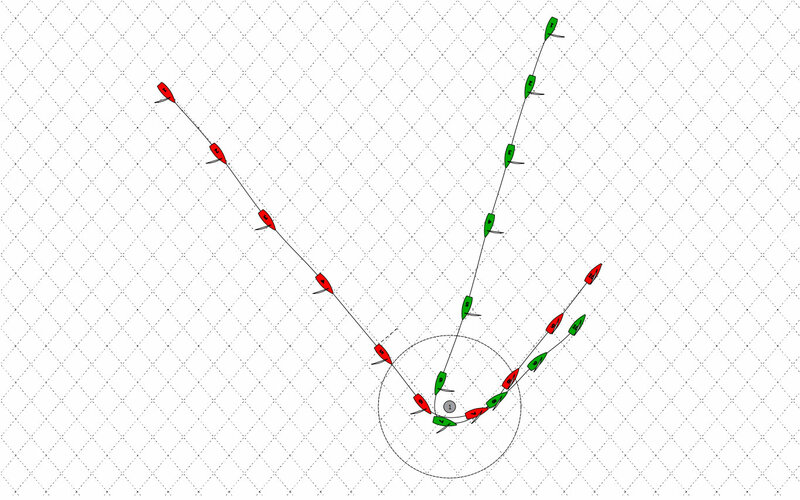 Positions change, an overlap is produced, a boat tacks and already other rules apply. It is important therefore to understand the interplay between the rules. The following are some cases for the themes so far. A starboard-tack boat that tacks after a port-tack boat has borne away to go astern of her does not necessarily break a rule. In this case the yellow boat bears away in order to pass behind the blue boat which has right of way. Blue tacks and keeps clear, as required. Yellow is not obstructed. When, after having been clear astern, a boat becomes overlapped to leeward within two of her hull lengths of the other boat, the windward boat must keep clear, but the leeward boat must initially give the windward boat room to keep clear and must not sail above her proper course. Rule 12 ceases to apply with the beginning of the overlapping. After the overlapping to leeward, Rule 11 applies, and the windward boat must keep clear. 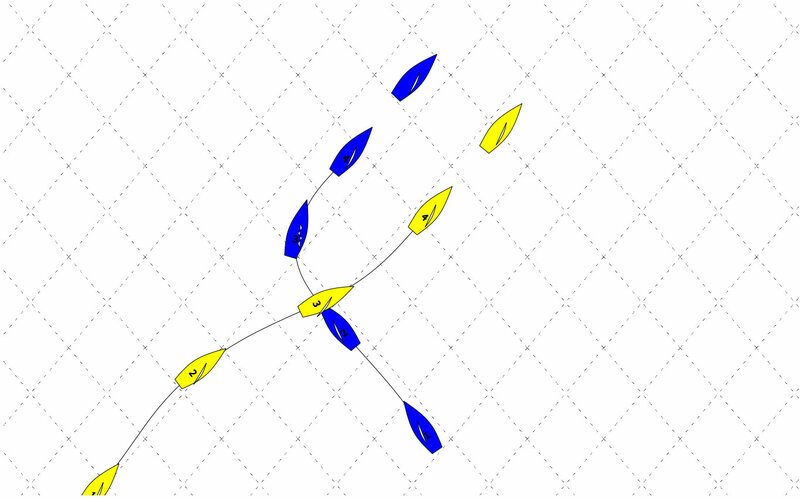 The following animation shows the occasion for Case 7. 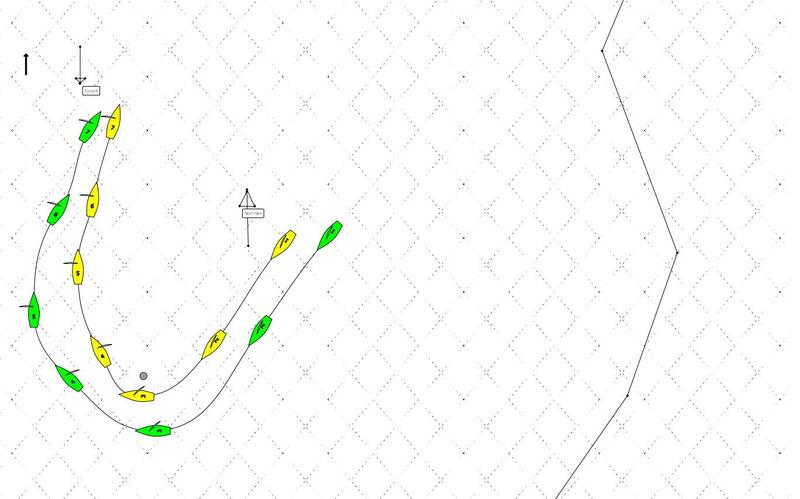 Yellow establishes an overlap to leeward, then both boats move on next to one another for a while. Then Yellow luffs to get to the mark. Yellow is subject to Rule 17, because it produced an overlap from the rear, but doesn't break this rule as Yellow never moves above its propert course (refer to definition of proper course). Rule 15 (Acquiring Right of Way) no longer applies as the boats have already sailed along next to one another for a long time. When Yellow luffed, Blue had plenty of time to keep clear, so Yellow didn't infringe Rule 16.1 (Changing Course). Therefore, according to Rule 11, Blue should have kept clear and would be disqualified in this case. Before her starting signal, a leeward boat does not break a rule by sailing a course higher than the windward boat's course. The Blue boat must keep clear under Rule 11, even when Blue sails a higher course than close hold. Though Blue overlapped from behind and is bound by Rule 17, according to the definition there is no proper course before the starting signal. The Green boat had enough time to react to the change of course. The fact that Green when keeping clear before the starting signal lands over the starting line, does not excuse it from obeying Rule 11. When, owing to a difference of opinion about a leeward boat's proper course, two boats on the same tack converge, the windward boat must keep clear. Two boats on the same leg sailing near one another may have different proper courses. 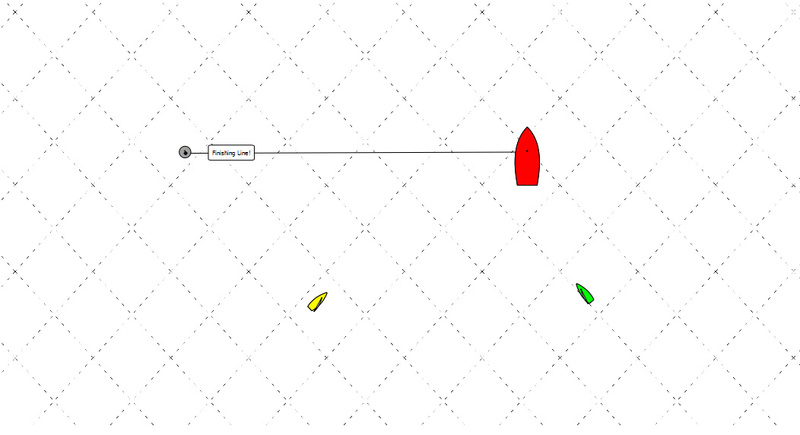 In the example for Case 14 (see next animation) it shows that two boats can have different opinions about the proper course. After rounding the mark, the direct route to the next mark is straight up. The Yellow boat wants to sail direct to the next mark. The Green boat thinks that due to the counter-current it would make more sense to take a longer route and to sail closer to the land where the current is not so strong. Although Green overlapped from behind and is therefore subject to Rule 17, it sails no higher than its proper course. Yellow must, under Rule 11, keep clear of the leeward boat. In the next case two different types of boat meet up with one another. It is well known that Lasers are running downwind at a very diferent angle than catamarans to sail an optimum downwind VMG. In this case the catamaran overlaps from behind and is therefore subject to Rules 17 and 15. For this reason the green catamaran must first bear away to give the Laser the chance to keep clear, under Rule 11. Once the Laser has fulfilled his obligation, the catamaran can luff onto his correct course, though still bound by Rule 16.1. A boat clear ahead need not take any action to keep clear before being overlapped to leeward from clear astern. There are still about 30 seconds before the starting signal. The Blue boat approaches from behind and creates an overlap to leeward. From this moment Rule 11 applies, but also Rule 15. From the moment the overlap occurs, Blue must do all it can to keep clear of Green. However, due to being so close to Green, despite the chosen control, Blue cannot luff. Green therefore has infringed rule 15. If there is contact green should be disqualified. 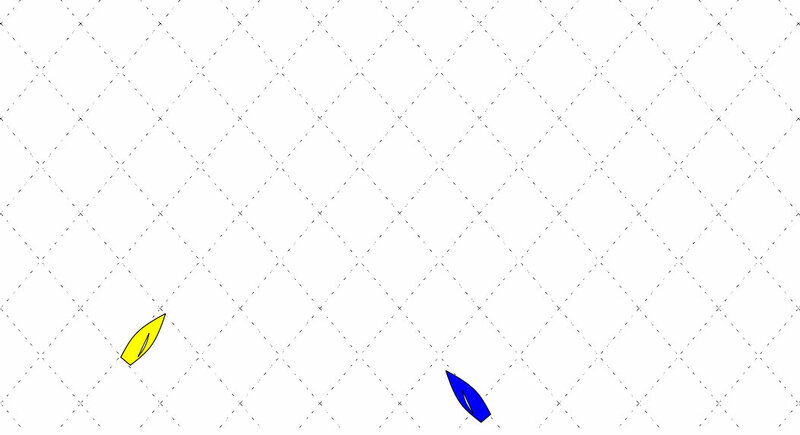 In the following animation, Blue establihes an overlap to leeward. Red is subject to Rule 11 and must keep clear. Under Rule 15, Blue initially has to give Red room to keep clear. In this case Red cannot change its course, due to the overlapping created by Blue, without touching Blue. If it came to a protest, in this case Blue would be disqualified. 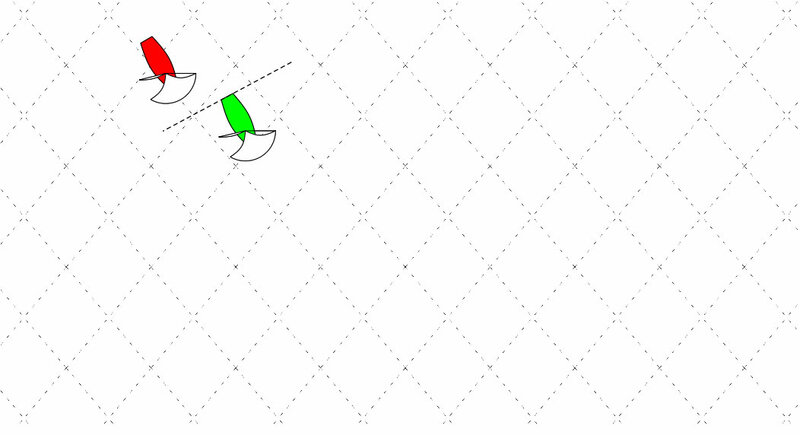 In this case Green creates an overlap to leeward and is bound by Rule 17 (on the same tack; proper course). However, it is clear that Green's proper course will go to the finishing line. Therefore Green is not breaking Rule 17. Blue had enough time and opportunity to keep clear. Under Rule 11, Blue must keep clear and would be disqualified if a protest was made. 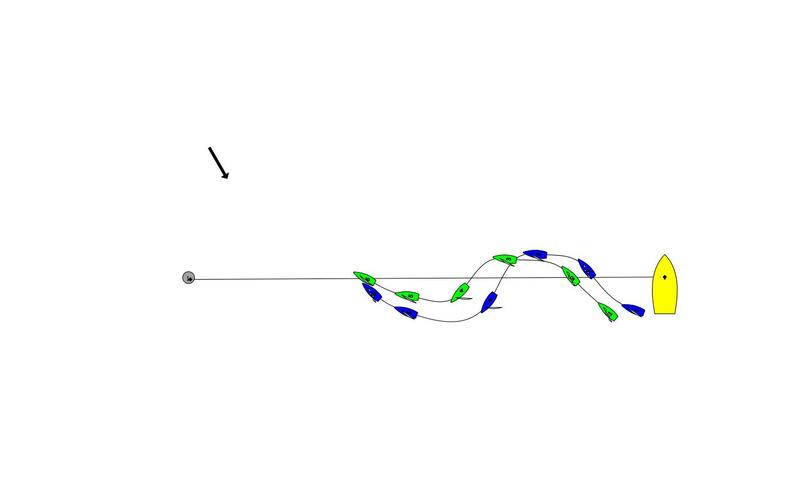 In the following animation, both boats sail lower than their proper course at the beginning. 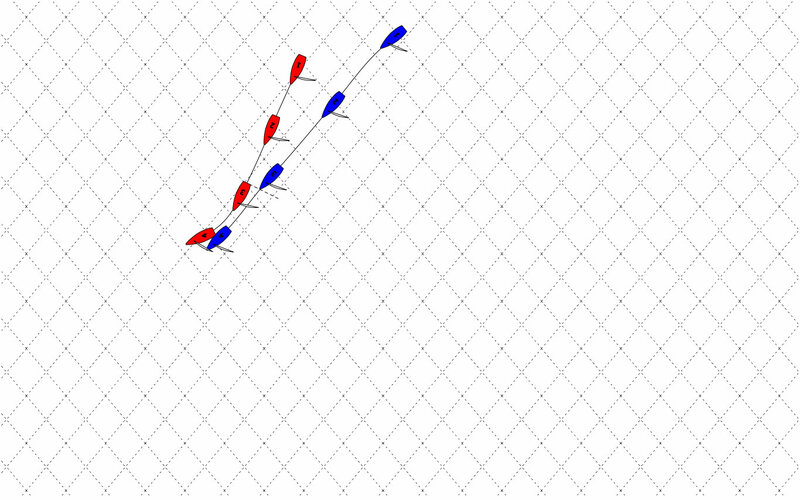 Red produces an overlap from clear astern and then luffs onto its proper course. For the same reasons as in the previous example, Red is not breaking Rule 17, and Blue must keep clear, as it does in this example. Actually this is straight forward, but where is it stated/written? The following Rules make it clear that sailing is normally a sport for taking ownership, being responsible. Each sailor is responsible themselves for obeying the rules. Normally there is no umpire on the course to punish any breaches. A boat and her owner shall compete in compliance with recognized principles of sportsmanship and fair play. A boat may be penalized under this rule only if it is clearly established that these principles have been violated. The penalty shall be either disqualification or disqualification that is not excludable.. The following Q&A stems from November 2011 and caused a lot of excitement at the ISAF World Championship Olympic classes in Perth. A German 470 ladies' team only saved its narrow lead in the Olympic qualification, by consistently hindering their immediate opponent without considering their own result. This divided the sailing world, but is covered by paragraph (b) in this Q&A. A protest by the other boat that Rule 2 had been broken was overruled by the international jury. 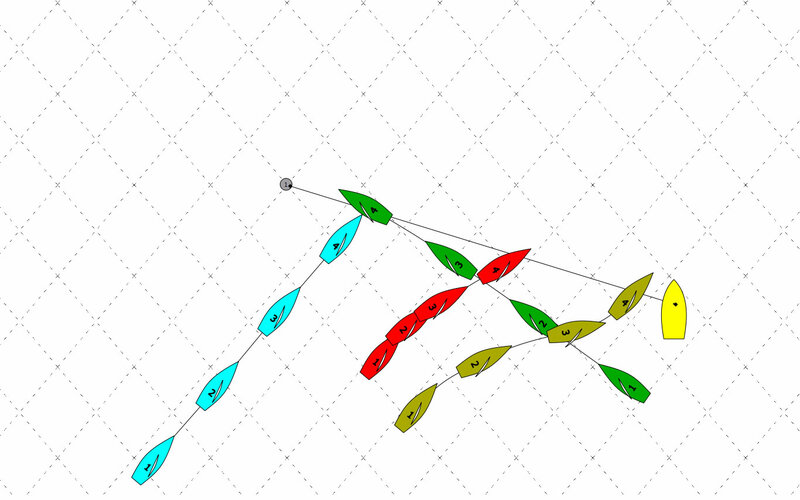 In a fleet race, Boat A adopts tactics that clearly interfere with and hinder Boat B's progress in the race. While using those tactics, boat A does not break any rule, except possibly rule 2. In which of the following circumstances would Boat A's tactics be considered unsportsmanlike and a breach of rule 2? (a) Boat A's tactics benefit her series result. (b) Boat A's tactics increase her chances of gaining selection for another event. (c) Boat A's tactics increase her chances of gaining selection to her national team. (d) Boat A and Boat C had agreed that they would both adopt tactics that benefited Boat C's series result. (e) Boat A was attempting to worsen Boat B's race or series score for reasons unconnected with sport. In circumstances (a), (b) and (c), Boat A would be in compliance with recognised principles of sportsmanship and fair play because there is a sporting reason for her actions. In circumstance (d), both Boat A and Boat C would clearly break rule 2. In addition, by receiving help prohibited by rule 41 from Boat A, Boat C would also break rule 41. In circumstance (e) Boat A would break rule 2 because, with no good sporting reason, her actions would clearly break recognized principles of sportsmanship and fair play. To summarise, these Q&As mean that, whatever the reason, any boat can use match race techniques to get ahead of another boat as long as it somehow directly profits in some way. As before, it is not permitted that someone does the 'dirty work' for someone else, e.g. a fellow team member and drives back an opponent for them, using match race techniques. Both the following cases are about how far it is allowable to touch another boat, which is supposed to give way, with the body or with the hand. Case 73 states that deliberate touching of another boat is not fair if it is specifically intended to hinder that boat from keeping clear. However, in case 74 a change of body position within normal limits is allowed. When, by deliberate action, L's crew reaches out and touches W, which action could have no other intention than to cause W to break rule 11, then L breaks rule 2. 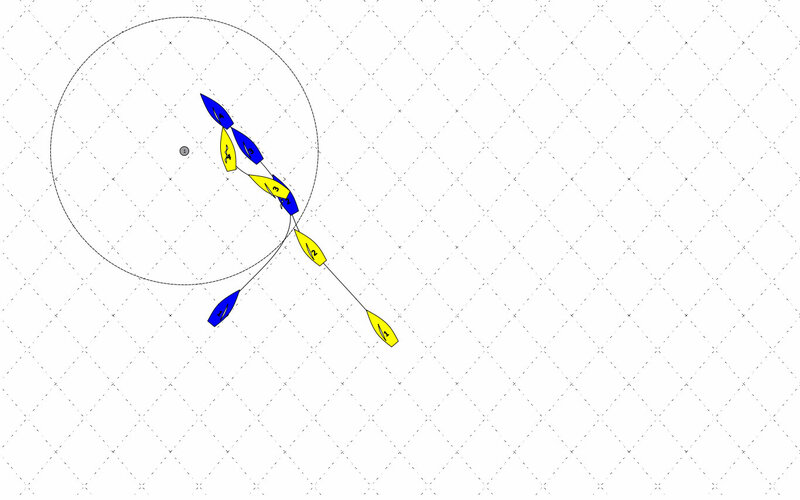 W and L were overlapped on starboard tack beating towards the windward mark. The crew of L, who was on a trapeze, reached out and deliberately touched W's deck with a hand and intimated that W should retire. L protested W. The protest committee disqualified W under rule 11 and she appealed. W's appeal is upheld; L is disqualified and W reinstated. Because L could sail her course with no need to take avoiding action and there was no risk of immediate contact had L changed course in either direction, W was keeping clear of L. Therefore, W did not break rule 11. The deliberate action of L's crew, which could have had no other intention than to disqualify W, broke rule 2. There is no rule that dictates how the helmsman or crew of a leeward boat must sit; contact with a windward boat does not break rule 2 unless the helmsman's or crew's position is deliberately misused. W was overtaking L in sub-planing conditions on a close reach. L luffed slightly, the helmsman's back making contact with W just forward of the shroud. At this point the hulls were about an arm's length apart. Neither boat took a penalty. At the subsequent hearing, the protest committee disqualified L under rule 2, stating that W was correctly trimmed with full sails and her crew sitting by the leeward shroud. 'Contact', it continued, 'could only have been made if L's helmsman was sitting out flat.' In the prevailing conditions this was significantly beyond the normal sailing position required.' L appealed. L's appeal is upheld; she is reinstated and W disqualified under rule 11. In Case 73 it is clear that L's crew deliberately touched W with the intention of protesting her out of the race. In this case there was no such deliberate action by L. There is no rule that dictates how a helmsman or crew must sit and, in the absence of deliberate misuse of his positioning, no breach of rule 2 took place. In Rule 41 it states that help from outside is forbidden unless it is unsolicited or is available to everyone. Help is always allowed if someone is in danger. (d) unsolicited information from a disinterested source, which may be another boat in the same race. However, a boat that gains a significant advantage in the race from help received under rule 41(a) may be protested and penalized; any penalty may be less than disqualification. Well known to all competitors is Rule 42. It states that we cannot use any unpermitted form of propulsion. What actions are permitted and what not will be an issue in an separate article. The full text of all regulations can be found at the World Sailing Site. The responsibility for a boats's decision to participate in a race or to continue racing is hers alone. A competitor shall comply with the World Anti-Doping Code, the rules of the World Anti-Doping Agency, and World Sailing Regulation 21, Anti-Doping Code. An alleged or actual breach of this rule shall be dealt with under Regulation 21. It shall not be grounds for a protest and rule 63.1 does not apply. Rule 22.3. Here also there was a change in RRS 2017 now boats moving sideways by backing there sail have also to keep clear..
NB: A boat can only be considered as capsized if her masthead is in the water. However this rule applies if the boat rights itself, as long as it is still not under control. While racing, a boat shall not touch a starting mark before starting, a mark that begins, bounds or ends the leg of the course on which she is sailing, or a finishing mark after finishing. There is a case for this which states that a mark is considered touched if any part of the boat's equipment touches the mark; even a spinnaker sheet or a boom. However this case also shows that a boat which must keep clear is not breaking any rule if it is touched by equipment belonging to a boat which has right of way, which unexpectedly changes its normal position. Nevertheless, I have also seen exceptions to ths rule in the sailing instructions. Contact with a mark by a boat's equipment constitutes touching it. A boat obligated to keep clear does not break a rule when touched by a right-of-way boat's equipment that moves unexpectedly out of normal position. 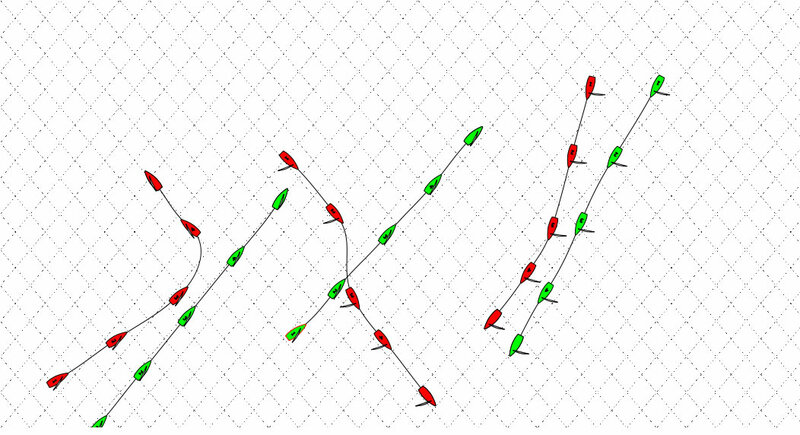 Boats A and B approached the leeward mark with spinnakers set. A rounds the mark clear ahead of B. A has difficulty lowering her spinnaker and, as she assumes a close-hauled course, her spinnaker guy trails astern by some 30 feet (9 m) and drags across part of the mark above the water. Later, when the mark is about five lengths astern of B, the boats are sailing closehauled on port tack and B is 20 feet (6 m) astern of A. A is still having difficulties handling her spinnaker and the head of her spinnaker unexpectedly streams astern and strikes B's headstay. What rules apply during these incidents and does any boat break a rule? When A's spinnaker guy drags across the mark, she breaks rule 31. A boat touches a mark within the meaning of rule 31 when any part of her hull, crew or equipment comes in contact with the mark. The fact that her equipment touches the mark because she has manoeuvring or sail-handling difficulties does not excuse her breach of the rule. When contact occurs later between the two boats, rule 18 no longer applies. 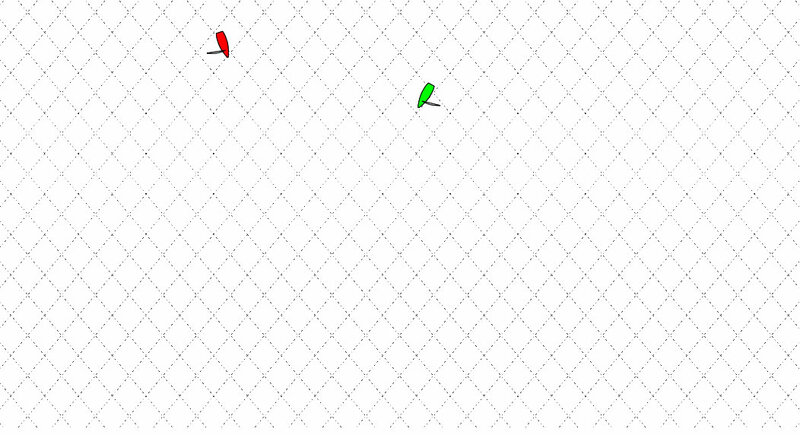 Because A's spinnaker is not in its normal position, the boats are not overlapped and, therefore, rule 12 applies. That rule requires B to keep clear of A, which she is doing because nothing B did or failed to do required A 'to take avoiding action' (see the definition Keep Clear). This is shown by the fact that the contact between them results exclusively from A's equipment moving unexpectedly out of normal position. Therefore, B did not break rule 12. Rule 14 also applied. A broke rule 14 by causing contact that she could have avoided. However, because there was no damage or injury, A cannot be penalized. It was not reasonably possible for B to avoid contact with A's spinnaker as it streamed astern, and so B did not break rule 14. Note that Case 91 also addresses an incident involving equipment out of its normal position. If reasonable possible, a boat not racing shall not interfere with a boat that is racing. In addition 24.2. says: If reasonably possible, a boat shall not interfere with a boat that is taking a penalty, sailing on another leg or subject to rule 22.1. However, after the starting signal this rule does not apply when the boat is sailing her proper course. NB: this also applies to team sailing events. Except when sailing her proper course, a boat shall not interfere with a boat sailing on another leg. Rules 25-27, 29, 30, 32, 33, 34. When flag Y is displayed with one sound before or with the warning signal, competitors shall wear personal flotation devices, except briefly while changing or adjusting clothing or personal equipment. When flag Y is displayed ashore, this rule applies at all times while afloat. Wet suits and dry suits are not personal flotation devices. NB: In principle, everyone is responsible for their own safety, including the wearing of a life jacket, regardless of Y. Therefore, some race committees apply Y only if a change of situation could be expected which the competitors could not predict (e.g. weather forecast predicts a storm). Be aware that this rule applies also for boats niot racing! when as a consequence of breaking a rule a boat has compelled another boat to break a rule, the other boat shall be exonerated. In Rule 3.3. (c) all participants and boat owners give up the right to resort to any court of law or tribunal. This rule is contrary to national legislation and in would probably not be valid in any serious case. In particular one cannot stop sailors turning to the International Court of Arbitration for Sport (CAS) in Lausanne..
At the Olympic Games in London the ISAF, under pressure from the Olympic Sailing Committee, specifically allowed participants to turn to the CAS as a last resort. the 'normal' rules of Part 2 Section A and Section B apply. Special rules are not necessary. Note however, that Section C - At Marks and Obstructions does not apply. Why doesn't Rule 18 'SECTION C - At Marks and Obstructions' apply at the start? In the introduction to Section C it states: Section C rules do not apply at a starting mark surrounded by navigable water or at its anchor line from the time boats are approaching them to start until they have passed them. For this reason, at the Start usually no boat can entitle Mark-Room. The only exception is if the starting line is not limited by a ship or a mark, but by land. But this is somehow logical. What else is there particularly to watch out for at the start? Rule 17 (On the same tack; proper course) doesnt apply, because according to the definitions, a boat has no proper course before the starting signal. 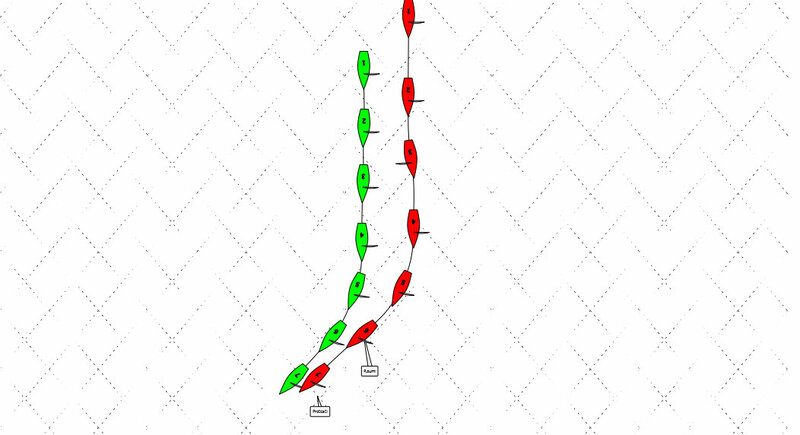 However, this doesn't mean that it is irrelevant how an overlapping was established in the pre-start phase, as every boat has a proper course after the starting signal. From this point a leeward boat that has overlapped from behind pursuant to Rule 17​​, may not sail above its proper course, even if this overlap was made ​​2 minutes before the starting signal. Race Courses lead, usually around marks. Rule 18 is about which additional rules apply when passing around marks. Rule 19 and 20 deals with obstructions. The aim of the rule is to pass around marks without contact to other boats.Basically all the other rules in Part 2 apply also at marks and obstructions. First we will look at the additional rules which apply to marks and obstructions, and then we will show some animations and ISAF decisions. The fact is that boats always come very close together at marks. In practice, especially in dinghy classes, touches and rule violations can't always be avoided. All our effort should be directed at avoiding damage to other boats in any situation. It is often better to give up a right of way and to get past a mark as quickly as possible, rather than to become involved in a mass collision. When do rules 18, 19, 20 apply? So far, so good; that these rules don't apply at the start we already know from the previous chapter. (d) if the mark is a continuing obstruction, in which case rule 19 applies. 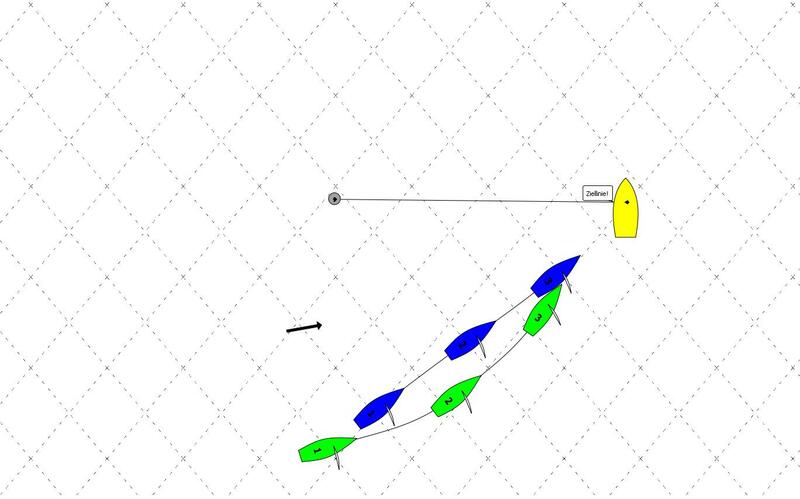 (a) When boats are overlapped the outside boat shall give the inside boat mark-room, unless rule 18.2(b) applies. (b) If boats are overlapped when the first of them reaches the zone, the outside boat at that moment shall thereafter give the inside boat mark-room. If a boat is clear ahead when she reaches the zone, the boat clear astern at that moment shall thereafter give her mark-room. (1) she shall continue to do so even if later an overlap is broken or a new overlap begins. (2) if she becomes overlapped inside the boat entitled to mark-room, she shall also give that boat room to sail her proper course while they remain overlapped. (d) Rules 18.2(b) and (c) cease to apply when the boat entitled to mark-room has been given that mark-room, or if she passes head to wind or leaves the zone. (e) If there is reasonable doubt that a boat obtained or broke an overlap in time, it shall be presumed that she did not. (f) If a boat obtained an inside overlap from clear astern or by tacking to windward of the other boat and, from the time the overlap began, the outside boat has been unable to give markroom, she is not required to give it. The basis of the rule is that the outside boat must keep clear from an inside boat in order to pass the mark or the obstruction. That includes the space for a tack or jibe by the inside boat. The overlap must be established outside the zone. It doesnt make any difference if the overlap is broken later.The moment from when the overlap must be produced is if the hull of the first boat (not the Spinnaker or the Bowsprit) enters the zone. The size of the zone depends on the length of the first boat that enters the zone. If one of the boats tacks, it loses the right to mark-room. None of the exceptions noted in Rule 18.1 apply. Therefore, Rule 18 basically applies. Red overlaps with Green at the moment of entering the zone. Therefore Green has a right to mark-room (18.2.(a). After rounding the mark the basic rules 11 ( a windward boat should shall keep clear of a leeward boat), and 12 (a boat clear astern shall keep clear of a boat clear ahead/) apply. 18.3 Tacking in the Zone If a boat in the zone of a mark to be left to port passes head to wind from port to starboard tack and is then fetching the mark, she shall not cause a boat that has been on starboard tack since entering the zone to sail above close-hauled to avoid contact and she shall give mark-room if that boat becomes overlapped inside her. When this rule applies between boats, rule 18.2 does not apply between them. 18.4 Gybing When an inside overlapped right-of-way boat must gybe at a mark to sail her proper course, until she gybes she shall sail no farther from the mark than needed to sail that course. Rule 18.4 does not apply at a gate mark. 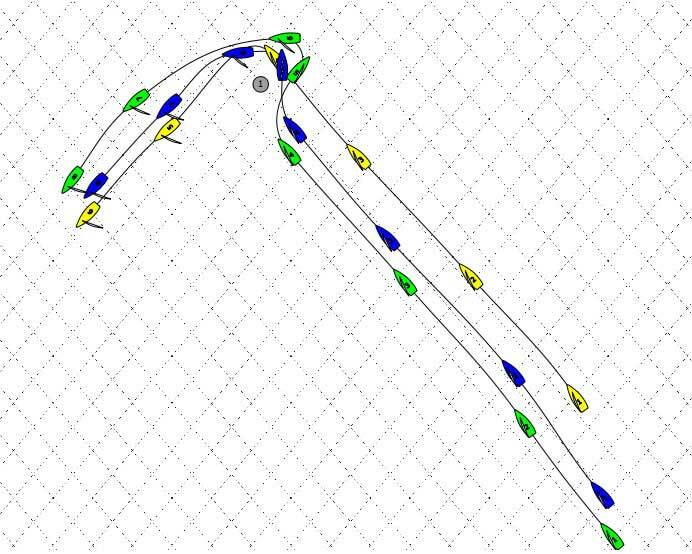 (b) when rule 18 applies between the boats and the obstruction is another boat overlapped with each of them. (a) A right-of-way boat may choose to pass an obstruction on either side. 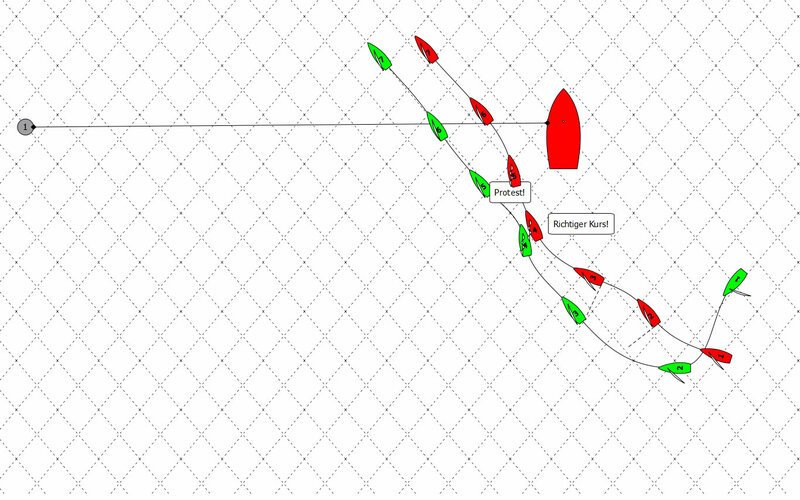 (c) While boats are passing a continuing obstruction, if a boat that was clear astern and required to keep clear becomes overlapped between the other boat and the obstruction and, at the moment the overlap begins, there is not room for her to pass between them, she is not entitled to room under rule 19.2(b). While the boats remain overlapped, she shall keep clear and rules 10 and 11 do not apply. (b) she is sailing close-hauled or above. In addition, she shall not hail if the obstruction is a mark and a boat that is fetching it would be required to change course as a result of the hail. (a) After a boat hails, she shall give a hailed boat time to respond. (b) A hailed boat shall respond even if the hail breaks rule 20.1. (c) A hailed boat shall respond either by tacking as soon as possible, or by immediately replying ‘You tack’ and then giving the hailing boat room to tack and avoid her. (d) When a hailed boat responds, the hailing boat shall tack as soon as possible. (e) From the time a boat hails until she has tacked and avoided a hailed boat, rule 18.2 does not apply between them. 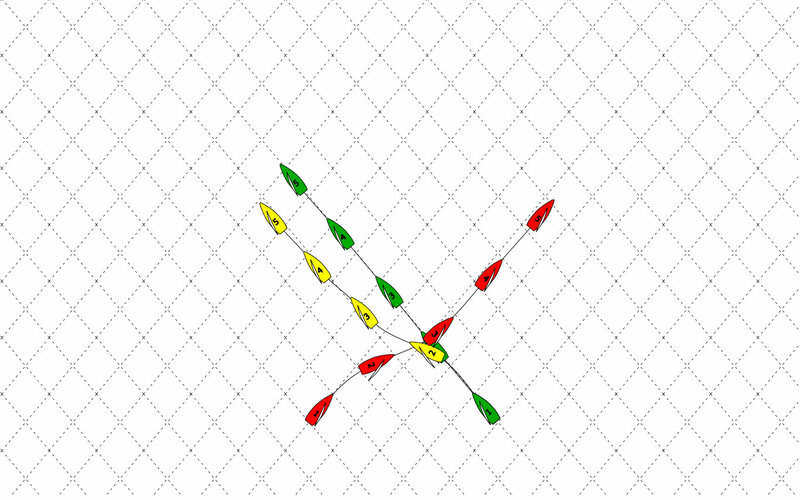 When a boat has been hailed for room to tack and she intends to respond by tacking, she may hail another boat on the same tack for room to tack and avoid her. She may hail even if her hail does not meet the conditions of rule 20.1. Rule 20.2 applies between her and a boat she hails. Further examples on marks and obstractions will follow later this year. 1. Penalties must be carried out after the Start. Many regatta sailors believe that they have to wait until after the start to carry out an penalty for breaking a rule before the Start. However, you will not find such a requirement anywhere in the Racing Rules.So, if you make a mistake and,brake a rule or more, carry out your penalty immediately. But don't forget, according to Rule 44.2 you must keep clear when dooing it.. Many believe that if the overlap was established from behind, it is not allowed to luff higher than clause hold. . Accordingly, a leeward boat before the start is only restricted by Rule 15 (Acquiring Right of Way) and Rule 16.1 (changing course). However, mark-room for a boat does not include room to tack, unless she is overlapped inside and to windward of the boat required to give mark-room and she would be fetching the mark after the tack. Nowhere you can find the obligation for the boat which has to give mark room to give enough room for a tactical rounding. Nevertheless, the remaining rules (e.g. Rule 11) apply also at marks. If I have right of way, I can of course make a tactical rounding. If I only have mark room, I have no right to do it. Yellow has to give mark room to blue, but must not give blue room for a tactical rounding. Red is the windward boat to green and has to keep clear. Green can require space do sail a tactical rounding. 4. I can gain redress if another boat has hindered me badly. This means: N.B. Redress can not be granted if there was no injury or no physical damage.